0 | 2 students enrolled. 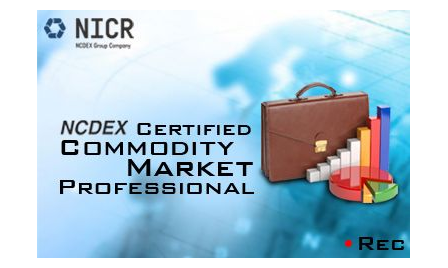 NCDEX Certified Commodity Market Professional certification is a comprehensive programme to prepare you for a career in commodity market. This course specializes on agricultural commodities traded in NCDEX. In this certification programme you will undergo training in various aspects of commodity market starting from very basics to how commodity markets function, to technical and fundamental analysis. You are introduced to the concept of derivatives and after all the basic knowledge you go deep into real market trading strategies based on fundamental and technical tools. Under this course “NCDEX Certified Commodity Market Professional”, the participant will be required to appear for two examinations, a) internal examination and b) certification examination. Please note that the participant will get the Certificate by NICR only after successfully clearing both the examinations. a) Procedure for Internal Test: This is an online examination hosted on the website of Elearnmarkets.com. Qualifying marks: 50%.No negative marking. Students are required to complete the course and schedule for the certification examination within six months from the date of payment of the course fee. To register, visit https://home.pearsonvue.com website to choose a convenient test centre. Subject to the availability of seat, book a convenient time slot. Qualifying marks: 50%. No negative marking for wrong answers. There will be a 10-minute tutorial before the test to make you familiar with the process. Immediately after you complete the test, you can collect your score Sheet from the Test Centre-Manager. Successful candidates will be issued a Certificate by NICR, which will be valid for three years from the date of the examination. Those who fail to clear the exam will have to register again as a fresh candidate.